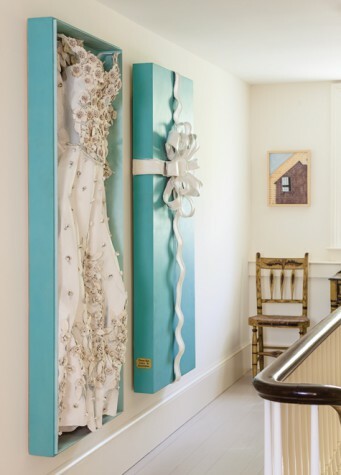 Brian White, the artist who created this wedding gown, will have a show in the barn gallery starting August 3. 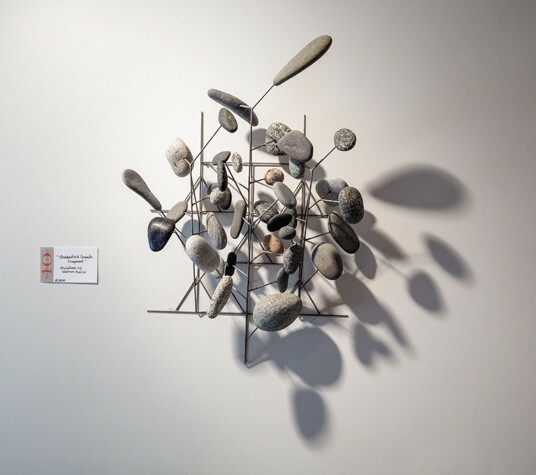 In the right light, Warren Seelig’s Shadowfield Granite Fragment multiplies on the wall. 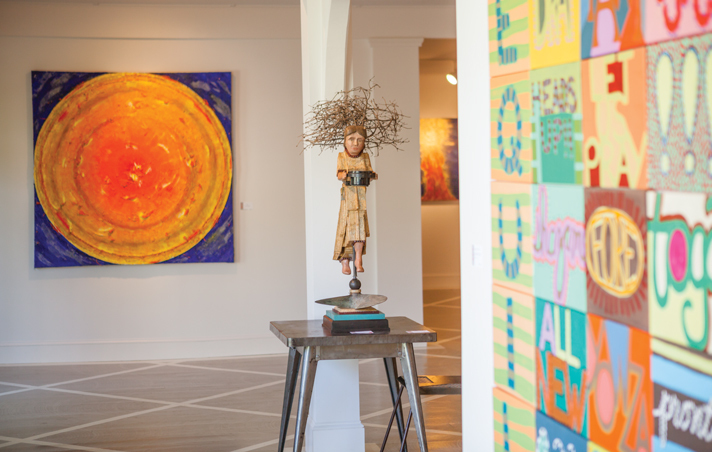 Inside the barn, a wooden sculpture by Harvey Peterson tiptoes between Rosi Reed’s Sun and Pamela Nelson’s Exclamation Quilt. 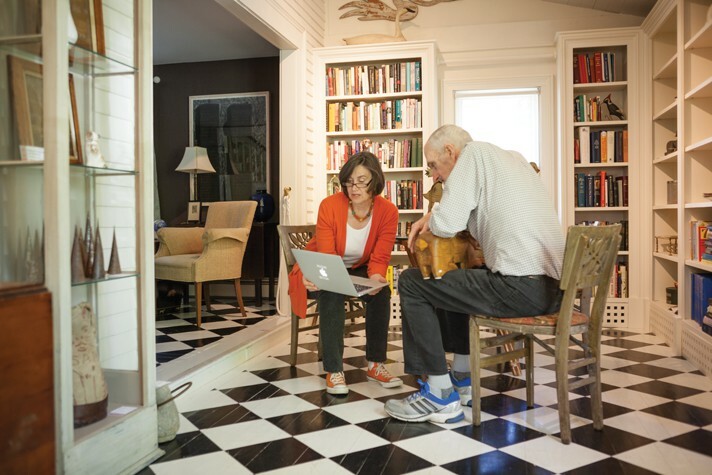 John and Sarah Ames, pictured in the antiques shop in their home; the rabbit-shaped saw on John’s lap is among the items for sale. 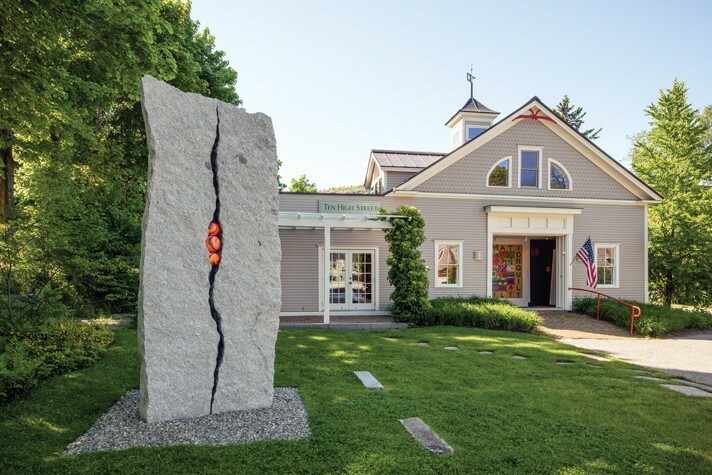 Artist Russ Kaufman’s 12-foot-tall granite sculpture, inset with lighted marble orbs, draws visitors in from the street to the barn gallery. 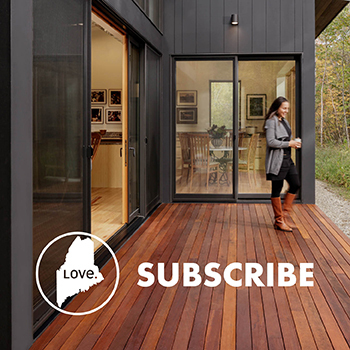 John and Sarah Ames don’t just live above the shop, they live in it. 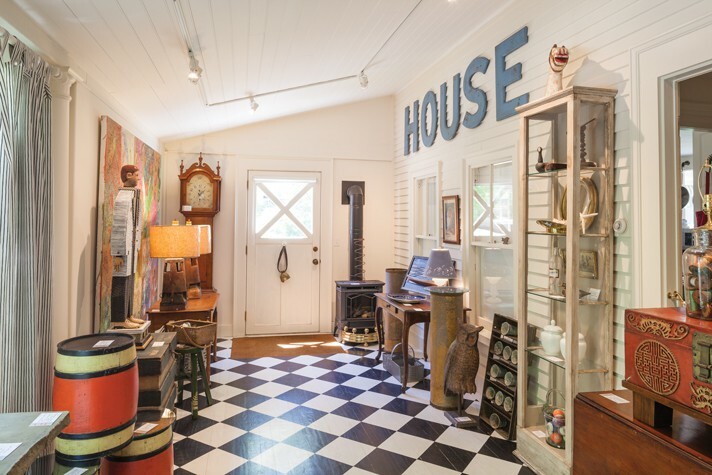 The owners of Ten High Street have dedicated a long room in their 1820 farmhouse on Route 1 in Camden to the sale of antique furniture, ceramics, and curiosities. The adjoining living space, separated only by a brief step up, is similarly furnished with period pieces. 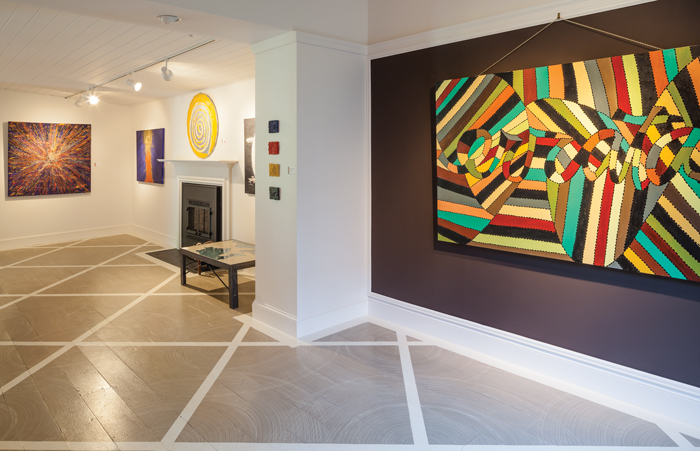 At the back of the house, the line between the kitchen and a pair of airy art galleries showcasing vibrant oils is more sharply defined: a rope hangs across the doorway with a sign that reads, in French, Attention Femme Mechant (Beware Evil Wife). 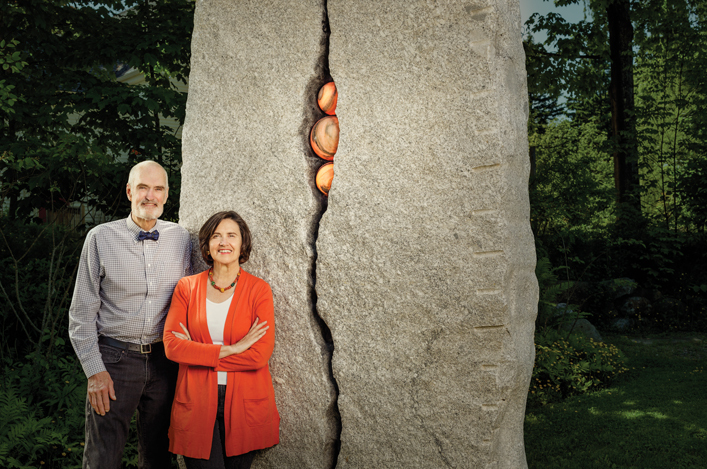 In addition to the exhibit spaces in their home, the couple maintains a third art gallery in an 800-square-foot barn on the property. A brightly colored acrylic by the artist Pamela Nelson is framed in the massive, square doorway. 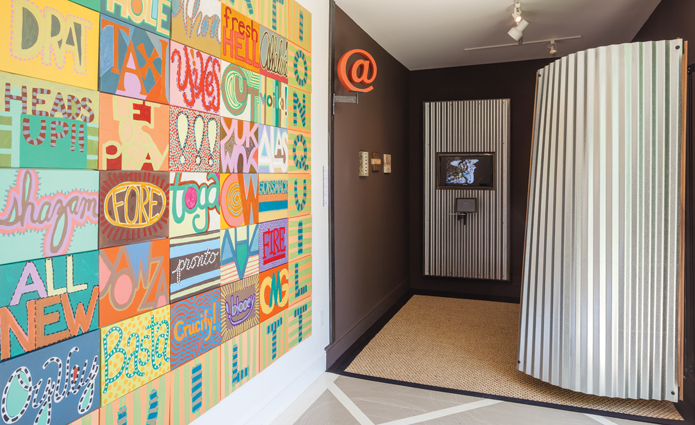 Titled Exclamation Quilt, the painting features a patchwork of words and phrases, such as “Fresh Hell” and “OMG.” Throughout the barn, similarly arresting works by Nelson—along with glowing, mixed-media celestial pieces by another artist, Rosi Reed—seem to leap from the walls. In a former life, the barn was filled with antiques. Sarah’s aunt and uncle operated their business, Schueler Antiques, out of the building and lived in an apartment upstairs. The house where John and Sarah now reside was a rental property. When the couple took over the company in 2002, they renovated the house and integrated the two buildings. The goal: create a home for themselves (Sarah’s aunt still lives in the barn apartment part of the year) and more space to expand into art, a shared passion. Sarah’s grandmother, Lillian B. Schueler, started the company in 1947 after her husband died. “She needed to support herself and the only thing she really knew about was antiques; she had collected a lot of nice things,” says Sarah. 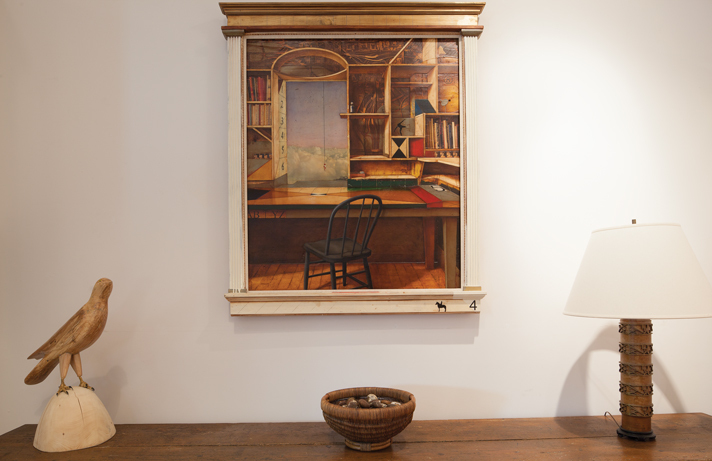 Schueler talked her way into the Winter Antiques Show in New York City, where she lived at the time, and sold the contents of her living room as seed money for a shop in Maine, a favorite vacation spot. For more than three decades, she presided over Schueler Antiques, which was then located a mile north on Route 1. The merchandise occupied a barn and the first floor of Schueler’s home, and she lived upstairs. “I remember she would stand at the juncture of the barn and the house, always wearing pearls and heels, cigarette in hand, and if she liked the looks of you, she’d say, ‘There’s more in the house.’ And if she didn’t, you never got out of the barn,” says Sarah. The highly personal nature of the business has been a major factor in its success, says John. 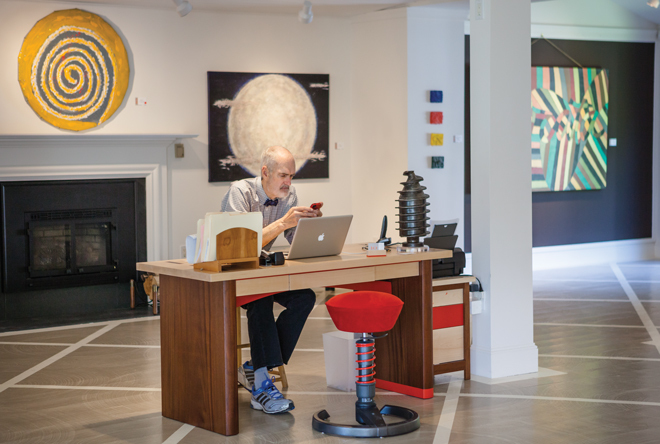 “To be a good art dealer, you have to sell what you like. In our case, we can’t get away from the things we sell, so if we didn’t like them it would rip us apart and make us terribly hypocritical.” Currently, you can find a nineteenth-century French side table and ornate Staffordshire plates intermixed, in the antiques area, with a statue of a man in a zoot suit and a rabbit-shaped wooden saw (John’s favorite piece). In the in-house art galleries, seascapes by Donald Demers and impressionist-like oils by Jessica Stammen offset the modern works arrayed in the barn. “Our taste is eclectic and, hopefully, interesting enough to keep people coming back, even if they thought something we did was god-awful,” says John. “And she’ll go crazy,” says John. “You’ll go crazy!” counters Sarah.